5 Comments for "Pumpkin Pudding"
Could I subsitute rice milk in the recipe. We will test this soon and report back. The question is whether the pudding mix needs casein (a milk protein found in dairy milk) to thicken the pudding as expected. We looked at two brands of instant pudding mix. One includes dry milk solids in the ingredients. This would include the milk protein. The other brand does not have dry milk solids but does say it will not thicken with soy milk. Great adaptable recipe! I didn't quite have one of the ingredients....instead of instant pudding I had a regular pudding mix that was 4.6 oz versus the 3.5 ounce box called for in the recipe. I went ahead and used it and it thickened and the recipe was a great hit, my 4 year old loved it!! I used 1/2 cup plus 1 tablespoon of the box of pudding i had. I stirred all the ingredients of the recipe into a pot and then as the box directed me i stirred the pudding ingrdients over medium heat until it came to a boil and then I took it off the heat and let it cool. It thickened through this process and as it cooled thickened even more into a great pudding. 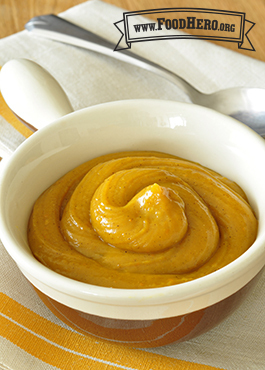 We will make this again, it really tastes like pumpkin pie filling! Love how much pumpkin is in this recipe. This recipe is a lighter, quicker alternative to pumpkin pie that my kids love. Made this for a tasting for 300 kids. They all (well, most of them) loved it! The only thing I did different is to cut the pumpkin pie spice by half, only put in 1 teaspoon per batch. Thought the 2 ts was a little strong for the kids.